Hya Wendy mentioned in another thread that a lot of stuff doesn't work in Carrara and we should have a sticky for it. I've bought quite a few items over the last few years that seem lame in Carrara so I think it might be a common problem, so I thought we could have a thread where people post their problems and others can post work arounds. That way we can help each other. I bought Forest a few months ago and Forest Supreme recently. Now try as I might I can't get the preload to load into Carrara - though it loads in poser no problems. If I save the scene as a Poser file then it still will not load into Carrara. The trick is to load everything separately (yawn) but this means everything is in the wrong place. The work around I finally discovered this morning is to select everything and align the x and y axii. 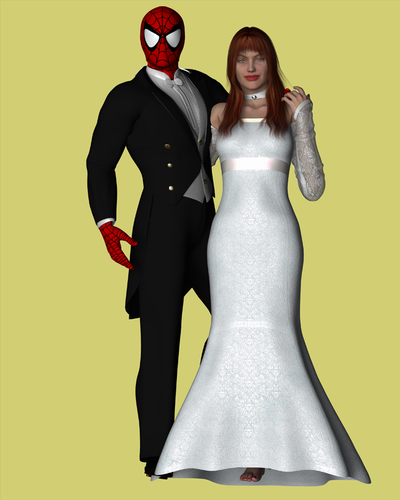 Most of it loads into Carrara, but I haven't had any luck with the skirt or Bra and veil. What does work, looks good. If anyone knows a workaround, please post it. Comes in with all constraints on so youy can't move the D%^^&&n thing in the assembly room! Wendy, maybe try selecting everything and aligning the x and y axii? I just bought the Library - same thing nothing comes in aligned properly. I will try it when I get home. 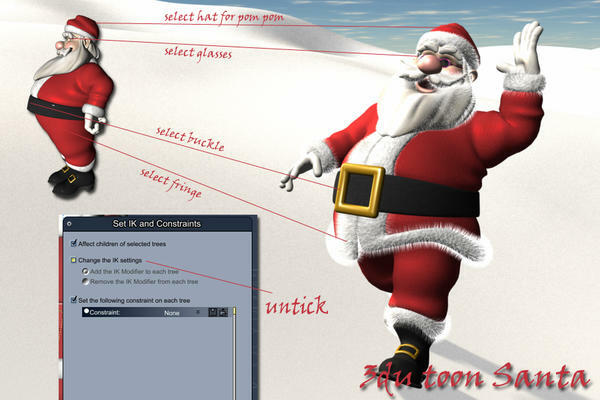 It says it just works in Poser and not Daz Studio, but I bought it and tried it in Carrara. It loads and renders OK. You just can't pose V4 with it. 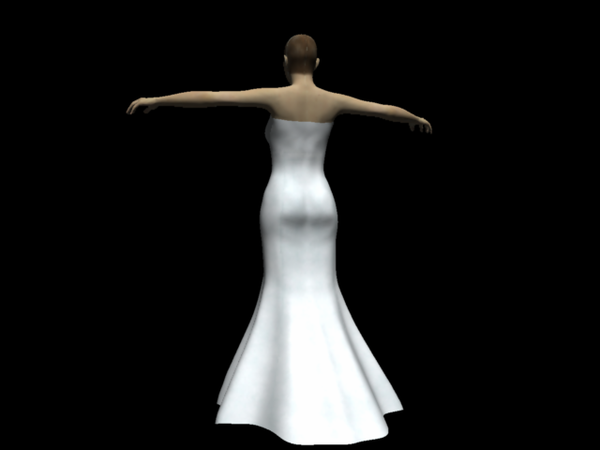 I understand that if the legs move too much they'd come through the dress, but a simple bend at the waist causes the dress to pop out of the back. I haven't found a work around. Any ideas? It's Poser dynamics and not a conforming figure as stated on the "Features"-page. funny one this one as I had the toon cow and bull working fine in the previous 8.5 build but they now don't work in the current build.. I think they broke something! When loaded Santa is missing several objects..
4. the fringe of his coat. Select each item and then Animation---> Set IK & Constraints then untick Change the IK setting. wow Stezza, how did you ever discover that? seems to be a common problem with 3DU stuff.. the same applies to Toon Gramps lab coat..
also you can use attach skeleton and weightpaint it, unless it was made by Optitex, it would not work in studio either. yes I tried ball joint ik on the toon cow cr2 I created which also fixes some fbx imports but the mesh still just stretches, might look at Fenrics Poser figure plugin maybe as it is a weightpainting triax thing. the duf import just errors. I can import the fbx from studio into iclone 3dxchange pipeline, retarget and apply imotions and re-export it into Carrara, replicated a herd that way creating an animation group and converting the keyframes to nla and looping. fbx straight from studio btw is mangled in Carrara 8.5 but out of 3dx5 pipeline fine. One I haven't worked out yet is how to get a shadow catcher to work in DT urban recreation..
just use the image in the background and an infinite plane with a shadowcatch shader, you can replicate shadowcatch shaded grass mesh on it too for added coolness, I use Howie Farkes stoney creek grass tufts but any inc Lisa botanicals grass would do. Thanks everyone for the information. I usually check to see if clothes are dynamic. I guess I missed it this time. I am able to get some static poses that look pretty good though. You might be able to tease a tiny bit more usability out of that item by turning off any body part covered by the dress. Does anyone have any workarounds or suggestions? Is there a later version I need to download, or would the current beta build help? Finally, if I cannot get M4 Beard to look better, would the Gen 2 or 3 beard look better, if I can get it to work with M4?. Hello , yes it's a nuisance. You need to select the model/ beard and go into the shader room. Look for the alpha maps in each part of the beard. The alpha maps have a texture map somewhere in the alpha map hierachy. Drag it to the top of the alphamap section. While you are in the texture room get rid of the value in the highlight section. If there is no bumpmap copy the texture map in the coloursection and paste it into the bumpmap section. this is from memory but it should fix the problem. I do Headwax's steps with lots of hair in particular. turning off highlight in clothes usually needed too. hairs often load without their alpha maps oddly. I would kill for a plugin to turn off the highlight on every shader in the scene!!! or make it default to none. common issue also with imports esp fbx and those load with layers lists which are even harder to navigate through finding highlight channels. all my iClone figures come in looking like plastic dolls. and don't ask me about adjusting the highlight on EVERY plant, rock, stone etc in Stonemason's enchanted forest!!! yes that is a nightmare!! Wendy, I hope and pray that Fenrick - God BLESS YOU FENRICK - is working on a plugin to do just that. I hope you can select a hierachy and change a particular parameter in every shader. I have been looking for a fix for a long time. Yes, that is the product. I'll give those suggestions a try this weekend. Thank you. No problem, good luck. Pity Daz doesn't give these things to a Carrara user to try first before they sell them. Hehe, heh, yes, ahh the joy of getting stuff that I don't need with money that I don't have. The beauty of virtual toys is that they fit nicely in the virtual garage.